480 pages | 38 B/W Illus. A chapter dedicated to distinguishing between policy analysis, policy research, stakeholder analysis, and research about the policy process. An extensively updated chapter on policy problems as market and governmental failure that explores the popularity of Uber and its consequences. The presentation of a property rights perspective in the chapter on government supply to help show the goal tensions that arise from mixed ownership. An entirely new chapter on performing analysis from the perspective of a public agency and a particular program within the agency’s portfolio: public agency strategic analysis (PASA). A substantially rewritten chapter on cost–benefit analysis, to better prepare students to become producers and consumers of the types of cost–benefit analyses they will encounter in regulatory analysis and social policy careers. A new introductory case with a debriefing that provides advice to help students immediately begin work on their own projects. 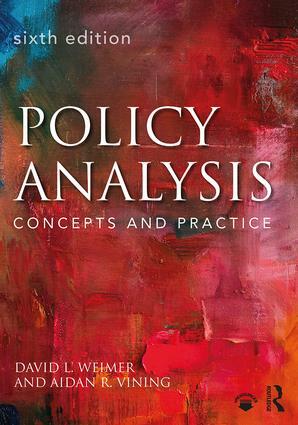 Policy Analysis: Concepts and Practices remains a comprehensive, serious, and rich introduction to policy analysis for students in public policy, public administration, and business programs. Chapter 2: What is Policy Analysis? David Weimer is Edwin E. Witte Professor of Political Economy at the University of Wisconsin-Madison, USA. Aidan R. Vining is CNABS Professor of Business and Government Relsations at Simon Fraser University, Canada.